I’ve been working in and around traditional Customer Relationship Management (CRM) for over 20 years. As the Farmer’s insurance guy says “I know a thing or two, ‘cuz I’ve seen a thing or two.” I’ve been on a long struggle to understand my customers, and in doing so realized that the tools and platforms we’re using need to be blown up and thrown out with the trash! I started all this nonsense talk on Paul Greenberg’s ZDNet blog about 4 years ago in a post entitled Reinventing CRM. If you have time, I hope you’ll have a read. I’m ready to get more prescriptive than I was then. Well, some of that will need to come with another post for everyone’s sake! Let’s first identify the constraints that old-timers like me used as excuses for CRM project failures over the years. We need to get these out of the way since they’re no longer valid. We had to custom develop methods to eliminate steps for our customers. This software was mostly plain vanilla. Since we didn’t speak a common language, and many of the early consultants were accountants and salespeople bored with their careers, this was messy (I made some money fixing this kind of stuff over the years). Writing custom client-side code made it extremely difficult to integrate end-to-end workflows (cross-functionally) and typically ended up as a plate of spaghetti. I wore a bib to work some days. Then there are the constraints that haven’t changed, even in the age of the cloud (our savior). CRM platforms were (and are) designed functionally, which means the linkage between business groups is artificial and fragile. We’ve made strides in the age of the cloud; but the pieces we are stringing together were not designed from the ground-up as an integrated architecture. They’re pieced together from acquisitions; and we all know how that ends up going. I won’t name names. Salesforce automation puts salespeople in the field where they can sell. Even if that’s true, efficiency is not a growth driver. At best, it’s an enabler. But, do salespeople (closers) actually spend more time in the field closing qualified prospects, or do they spend there time drumming up their own leads because the marketing team is driving junk to their inboxes? We’ve seen the evolution toward cloud-computing and it has been heralded as a major disruptive innovation. It was, but it disrupted the technology world, not so much the CRM world. CRM software looks fundamentally the same. The pitch is that CRM will make your marketing more agile because there is so much more data available. The truth is that marketers don’t know what to do with the data they had, let alone a new pile of unstructured big data that’s backward-looking and data scientists who will never find a way to predict much with it. “Hey Customers, you can configure it any way you like!” Which is true, and one of the reasons large consultancies make so much money setting up Centers-of-Excellence once that fails miserably. Mobile-first is a logical next step for cloud platforms; but that’s just convenience and context. It gets people away from their desk. But, does it generate more qualified leads, or does it somehow help you understand your customers’ needs better? No. It makes playing golf more convenient and guarantees more distractions while trying to build in-real-life relationships (the sticky kind of relationship). I’m not going to drain this topic any further because deep down, we all know that more businesses (like yours), did not start growing more (which is what they want) because of some evolution of CRM technology. The vendors don’t get it and you are the lucky beneficiaries who are not having your needs fulfilled. New product launches continue to fail at the same rate, and will continue to do so. Regardless of what I say. It’s inevitable. Sorry. We want to find markets where there is real, tangible opportunity. In other words, we only want to invest our capital in initiatives that have a high probability of success. Those could be products, services or new business models. We want to minimize our exposure to wild-goose chases (products and services no one wants) or poorly design offerings (products and services people want, but which didn’t properly or completely address unmet needs in the market. We want to make sure that when we unearth a winning concept in the market that product designers understand why it’s a winning concept so they can design a winning solution. Marketing, Sales, Fulfillment, Logistics,Training, Support, etc. also need to understand why, so they can each understand the language that resonates with their customers at the various life-stages where interactions between customers and the brand take place (call this the customer experience; but please note that if you don’t get bullet one and two right, it won’t matter). The bottom line is that while the percentage of winning solutions probably won’t change much, we have an opportunity to dramatically reduce wasted capital, and the amount of value-destroying messaging consumers must sift through on a daily basis. Imagine a world where the only messaging you received was relevant. Or, imagine a world where businesses no longer invest in product development that has an unknown outcome. If we could do either, or both, wouldn’t it be a much better world? We could spend our time leap-frogging instead of fast-following and/or fast-failing. How is CRM helping us? Is it time to move on? One of things that I pointed out in my “Reinventing CRM” piece is that vendors have given us a one-size-fits-all option where we can feel that we’re differentiating ourselves with the same tools as our competitors. Let’s face it, the vendors out there are doing no better at finding growth — profitable growth — than the rest of us. So why do we keep hiring them? Profitable growth is what every business is after — give or take — right? The reason I said this was simple: businesses are hiring CRM software to help them achieve their goal of sustained, profitable growth. Yet, we all know that this takes more than marketing, sales and support — or do we? As we’ve cycled through all the new terms like Customer Experience Management (CEX), Customer Success, Customer Engagement, and Digital Transformation, we’ve dramatically failed to see that while we have a lot of new toys, we aren’t really accomplishing our long-standing goals. Can I share with you what I’ve learned? I started my journey just over 10 years ago. I won’t bore you with the details, but at one point I was writing highly technical blog posts about some cool stuff I had done with CRM software. It was cool for developers; but my passion had been migrating more toward customers and what they were really struggling with. I was encouraged to share this journey by Bob Thompson over at CustomerThink. It was clearly my one-way journey and I haven’t looked back since. It has been a rather lonely journey. I’ve studied and iterated through many approaches to uncovering customers’ needs. The realization that they didn’t need CRM software took awhile to seep into my thinking. So, I was like everyone else, framing up needs bounded by the solutions we had to work with. I enjoyed designing ways to make the user experience better; based on what I learned in interviews and observation. But there was still something extremely dissatisfying about it. Probably much like the dissatisfaction felt by whomever came up with Material Design. I mean come on! How did that make my life better? Here are some baseline observations that you’ll have to embrace if you’re going to continue with my journey. It’s about to be like that first time you swallowed a non-candy-coated aspirin as a kid. Requirements are not customer needs. Neither are specifications, wants, desires, pains, delighters, benefits, etc. Any of this mish-mash of inputs must trace back to real customer needs; or they are just ideas, guesses, or contained within the boundaries of current solutions (product-centric). Customer needs are not variables. They don’t change over time. It is the unmet needs of today that will determine the successful solutions of tomorrow. If you don’t know them, you’re guessing and (statistics show) you’re failing. Unmet needs are a subset of all customer needs, as are over-served needs and table stakes needs. This population rarely changes (unless context changes). This is no different in product development than it is in the implementation of CRM software; or so-called customer experience strategies. All customer needs can be known. Customer needs are stable over time. They are directly related to a goal or objective of a customer; which is also stable over time. This objective is known as the customer’s Job-to-be-Done. To reliably create winning concepts in the market, you must understand the customer’s Job-to-be-Done, the steps they take to accomplish it, and the metrics they use to measure success. Customer needs are in reality forward-looking customer success metrics. When developed and used properly (it only takes once) they provide a roadmap to predictable success over time. All aspects of customer success can be measured this way. This includes winning product and service concepts, winning concept designs, winning demand generation (messaging) and winning in the consumption chain jobs (what we typically label as customer experience). I thought social media was a complete waste, but in the early days, I did have some time on my hands and took a dive. While it has continued to be a broader waste of time, it did help me network within the CRM community in ways that went beyond my current partner channel (that’s systems integrator talk!). I was fortunate enough to be following my least favorite subject, Social CRM. I won’t go into it. But, I did meet a great group of friends that mostly disagreed with me :). I think we all agreed that CRM was not about software and that the vendors had hijacked the term. But, frankly, we were not all in agreement that the easy path was the worst path. I mean, we had careers to think about! I was searching for real answers (I told myself)! We all bantered about a lot and got to know each other, and then this other guy got invited into the group. He (and they) know who he is. He completely corrupted me, and it took me awhile to see that he had been on a similar journey (different starting points). Once I realized this, I took the red pill he offered and stayed in Wonderland to see how deep the rabbit hole goes. What I learned was that I had been focusing on the wrong thing my entire career…and so had nearly everyone else. Product and service concepts came from some mysterious land that I had never been to and knew nothing about. What I did know is that companies invested a lot of money in their attempts to find gullible buyers for what they did offer. There are so many moving parts to our world that it’s extremely difficult to see what’s really changing. What had to happen (for me) was a simplification to a point where I had a stable platform from which I could detect the change…reliably. I learned that customers have jobs they are trying to get done, and when doing so, they hire solutions. This is not a new concept, but in the rush to be relevant, people seemingly choose to change their language; perhaps in a reaction to the constant change going on in their peer groups. To make these choices requires a stable platform and stable inputs into the equation of innovation. And lest you think innovation only happens in the “Innovation Dept.”, think again. We are all innovators. However, in the context of a business that is serving customers, everyone in the business needs to speak the same language of innovation. Otherwise our current world happens! Think of a job as a process. 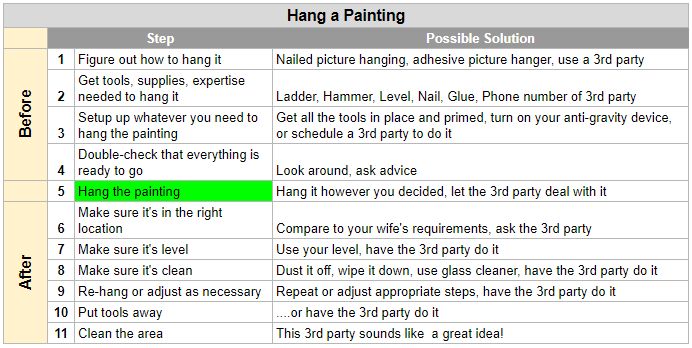 If we (the job executor) are hanging a painting, there are things we need to do prior to hanging the painting, and there are things we need to do after we hang the painting. While there are many ways to go about hanging a painting, the job (as a process) does not change because it does not prescribe how to hang the painting. The job is a stable platform. Consultants map-and-gap all day long. While they are generally fixated on the constraints of a business process (how we do it) and technology (how we want to enable it), mapping is powerful because it provides boundaries. The boundaries make sure we don’t wander; but just as importantly they help us ensure that there no holes in our logic. It’s very easy to spot a step that has not been adequately addressed. Acquire new customers — how do we target a market of interest, understand needs, identify winning concepts, design winning concepts, price it profitably, go to market successfully, etc? Grow existing customers — how can we help customers get more steps done in their core job, or how can we help them get more, related jobs done? Retain existing customers — how do we ensure that we are continually the best solution, and how do we design and measure experiences that take place during the “consumption” of our solution; e.g. purchasing, learning, using, maintaining, troubleshooting, etc. Yes, I stole that from the process world. But it’s true! If we make crappy products while focusing on improving our marketing capabilities; we’ll be perceived as spammers. If we make marketing super efficient at generating leads that Closers don’t value, our Closers will focus on generating their own leads. When this happens, marketing becomes a money pit, and sales doesn’t close the high-quality deals they’re expected to close…because they don’t exist! Please God, tell me he’s not going into this Jobs-to-be-Done thing again! Software and technology vendors in the “CRM” space are falling victim to the innovator’s dilemma. All of them. None of them can demonstrate their own consistent and profitable growth — more than a few months or years — yet will tell us that they are the answer to our wildest dreams. There are emerging technologies that are starting to get it and will be become a layer of abstraction (where our current vendors will no longer be a distraction) designed to better understand customer behaviours: at least the what, when and how part of the equation. There are still major gaps — such as our forward-looking capability , the why— which can only be filled by new thinking; and I don’t mean big data. I mean what I’m talking about in this post! The future of CRM is uncertain. There is a constant search for new terms as customers, vendors, analysts, consultants and futurists seek to be seen as different. But they keep cooking up the same stuff and serving it with a different sauce. Then they fight over definitions. We have no common language or capability to build the next, higher-order of solutions. Think of it as a standard innovation protocol. We need to stop looking backwards, understand what jobs customers are attempting to get done, and define the metrics they use to measure their success; not your company’s success. You will never predict the latter until you understand the former. CRM solutions will never achieve their rightful place in history until they help us do it. Build — Ensuring that the product and long-term roadmap trace back to marketing understanding and the evolution of customer needs: from unmet, to met, avoiding overmet. Yea, and all that testing and QA stuff. Efficiency — Once an enterprise has been organized around a market (or markets) comprised of certain customers and the jobs they are trying to get done, optimization of the integration between functional groups can ensue. That last one is where the vendors need to rethink things because CRM platforms will not look like contact managers anymore (and they still do!). Today we focus on functional efficiencies first, cross-functional efficiency next, and overall effectiveness never! I will continue to take what I’ve learned and integrate it into the work I do each day. One day that could mean providing a more integrated link between strategy and discovery (business/functional/etc. requirements). The next day that could mean introducing a more meaningful approach to journey mapping. Other days it could be getting marketing and sales to work off the same playbook as strategy and product development. I’m looking forward to the platform that gets more steps and jobs done that I know my customers are struggling with, and I’ll gladly pay your ridiculous price when you get there. I’ve based my thinking on a theory and approach that has evolved over the past 25+ years. It is used in many Fortune 500 companies; and unbeknownst to my clients, it has also been used with them as well. Maybe one day our CRM vendors will stop doing what’s right, and do what works. You Need to Know This New, Pioneering Approach to CRM was originally published in Effective CRM/CEX through JTBD on Medium, where people are continuing the conversation by highlighting and responding to this story.